DONETSK, July 11. /ITAR-TASS/. The self-defense forces of the self-proclaimed Donetsk People’s Republic have shot down another Ukraine air force plane over the town of Dzerzhinsk in the Donetsk region, the Novorossiya news agency reported on Friday. The plane reportedly fell down to the north from the Horlivka settlement in the Donetsk region. Earlier on Friday, the self-defence forces shot down another Ukrainian army aircraft, presumably an assault plane. The Ukrainian army has not confirmed this information. Earlier on Friday, a motorway bridge has been blown up in Ukraine’s southeast, the National Security and Defense Council said. The bridge connects two industrial centers — the towns of Dzerzhinsk and Horlivka. The explosion occurred one kilometer from the Mayorskaya railway station, the National Security and Defense Council's spokesperson Andrei Lysenko said on Friday. The train movement has stopped, he added. The National Security and Defense Council notes more cases of laying mines at major facilities. In recent days three bridges have been blown up in the Donetsk region: a motorway bridge on the Rostov-Kharkiv highway; a railway bridge at the settlement of Novobakhmutovka; and a bridge at the settlement of Zakotnoye. Railway lines have been blasted on the Skotovataya-Yasinovatay section of Donetsk railways. 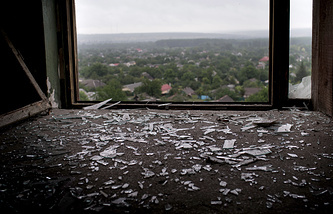 Two bridges across the Seversky Donetsk River and the Tepla River have been blown up in the Luhansk region.